DON'T ESTABLISH NEW MOOSE FARMS! Here I'll try to draw a conclusion. In my opinion, the pestilence of moosefarming which is spreading over Europe, North America and even Malaysia (sic!) will bring suffering to many moose. Among other cervids, a moose is a unique species. 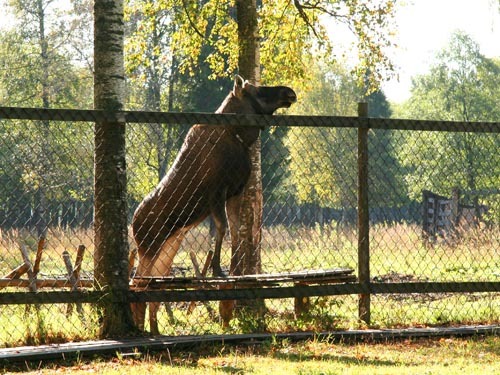 It is very easy to tame moose, but, as a rule, he cannot survive in captivity. With few exceptions, moose life span in zoos doesn't exceed 7-8 years, and then they are «replaced with new ones». I find keeping moose in captivity as cruelty to animals. 1. Moose pastures need special protection from poaching and ban of legal hunting, i.e. it is necessary to guard the whole home range from poachers and preserve biotopes producing moose food on its territory. Therefore, the domestic moose range must become a reserve (specially protected nature area) and this area must be equaled at least 36000-40000 ha. 2. Domestic moose will damage agriculture and silviculture areas. (In Russia this is traditionally ignored because fields and forests seem «everybody's means nobody's»). Gardens should be fenced. 3. A moose defending from real or imaginary threat or even playing can injure human. 4. Expensive radio tracking equipment is necessary to reveal animals' position and movements. 5. To avoid discontinuance in feeding which is very dangerous for moose, a moose farm must have its own forest reserve. 6. The Kostroma farm staff including administration, dairywomen, wood loggers, tractor drivers, wildlife guards, etc. agree by order of magnitude to the number of domestic moose. Breeding moose is very expensive. 7. In many countries a release of tame animals is prohibited by law; and their goodwill return for food, milking and giving birth in enclosures may fall under the definition of capture for sustain in captivity. 8. Some animals will be lost because of their emigration. 9. A prohibitive animal number on one moose farm depends on food productivity of the reserved territory, and in Kostroma region is about 50 in total, including 10-15 dairy moose. As far as I know, only Kostroma moose farm and Elk Island biostation keep animals semi-free permitting them either escape or «sell themselves for a bucket of oatmeal». So far no one succeeded in making a moose meat husbandry profitable. During the latest 30-40 years several state and private moose husbandries were organized and soon closed in Russia (in Yaroslavl, Vologda, Leningrad, Gorky regions, in Tatarstan, Karelia, Bashkiria republics). These moose farms kept animals in captivity and were oriented to meat production or «hunting» in enclosures. Even if your thoughts are heavenly, you love animals «alive», you want a peaceful coexistence, please, remember, «the morning sun never lasts a day» (sorry, this is the only phrase I found maybe near to what I wanted to say). The rest of your life may be too small to help the animals to survive because you can say you've saved an animal only if he died of old age. Your husbandry can be subjected to seizure like Moscow dolphinarium. The director can be «replaced» like in Elk Island. If a cruel law about «protection of animals from cruelty» like in Latvia will be issued, you will not be able to release tame animals, and all «wild» animals kept in captivity in a private property except zoos will be incurred «euthanasia». Expropriated animals will be confined in zoo cages, or exposed to violent «training» for a circus show. Please don't victimize animals, don't open new moose farms unless you can provide your pets the possibility to leave for anywhere they want, and then to return for caress, love (and tasty food). Perhaps, I'll continue to translate this section with my ideas about veganism in the future. Here is only a brief abstract. last but not least, sense of values, moral philosophy, if I think I am a human being. Upon a balance, I've chosen vegetarianism, I feel better if a moose is still living, I feel better (healthy), but I pay with some kinds of pleasure (compensated with some others; helping animals is pleasant) and some money.